For the fiscal year ending in late September, Apple is on track to deliver reported revenue of over $182 billion versus reported revenue in the prior fiscal year of $170.91 billion. In dollar terms, revenue growth in the range of $12 billion appears more impressive than the underlying revenue growth rate of between 6% and 7%. However, there are factors at work which will lead to faster rates of revenue growth in the new fiscal year beginning this fall. I will delve into a few of these factors in this article. 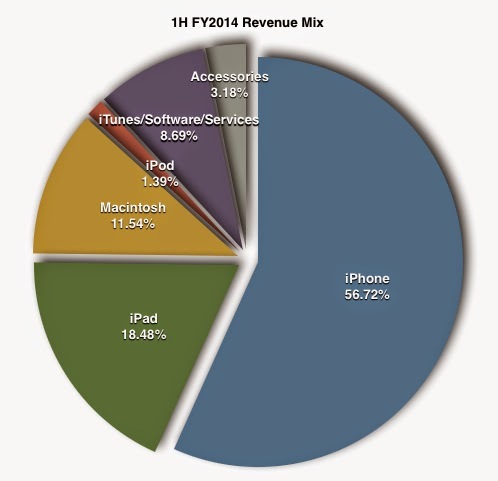 The graph below illustrates Apple’s revenue mix for the first half of the fiscal year ending in September. For the six-month period ended in June, the iPhone and iPad lines represented 75.20% of Apple’s reported revenue total of $103.24 billion. While Apple’s aggregate revenue rose 5.22%, the combined iPhone and iPad lines delivered revenue growth of 6.31%, the Mac line realized 8.64% revenue growth year-over-year and the combined iTunes/Software/Services & Accessories segments achieved revenue growth of 11.29%. The iPod line, in contrast, experienced a 53.82% decline in revenue. The iPod line’s revenue decline in the six-month period was $1.671 billion. iPod line revenue fell from $3.105 billion in the first six months of FY2013 to $1.434 billion in the first half of FY2014. The graph below illustrates the unit sales growth of Apple’s major product lines from FQ1 2011 through FQ2 2014. While there has been obvious moderation in the unit sales growth rates of the iPhone and iPad lines over this time, iPod unit sales have been in decline throughout the fourteen-quarter period. The graph below illustrates the average selling prices for each of Apple’s major product lines over the same fourteen-quarter period. Although the introduction of the iPad mini in late 2012 (FQ1 2013) reduced the average selling price of iPads, Apple has been able to keep the ASPs on iPhones and Macintosh PCs consistently high even as unit sales growth rates have moderated over the past several quarters. It was recently announced iPads and iPhones will again be sold through Costco. Walmart, in a high-profile move, has reduced the prices on iPhone 5 series handsets sold through the bricks and mortar stores when accompanied by a two-year contract. Apple is expanding the domestic sales reach of its current iPhone and iPad models ahead of the expected fall product refresh cycle.